The tradition started when the palatial Asian-inspired cinema was under construction. Owner Sid Grauman accidentally stepped into a freshly paved sidewalk. This inspired him to invite film stars Douglas Fairbanks, Mary Pickford and Norma Talmadge to provide the first celebrity footprints on opening day in 1927, initiating the now famous Forecourt of the Stars. Since then over 200 celebrities have had their footprints, hand prints and hoof prints immortalized in front of this Hollywood landmark. Frank Sinatra, Marilyn Monroe and Sydney Poitier are perennial favorites. Vin Diesel, Vince Vaughan, Melissa McCarhy, Ben Stiller, Tom Hanks, Robert DeNiro, Denzel Washington and Adam Sandler are relative new kids on the block. The Chinese is considered by many to be the most spectacular cinema ever built. At the time, Sid Grauman needed special government permission to import the pagodas, stone Heaven Dogs and temple bells from China. The building, which received historic-cultural landmark status in 1968, got a facelift when the Hollywood & Highland shopping and entertainment complex was built next door. The cinema was operated for many years by Mann Theatres. Angelenos resisted the name change to Mann's Chinese Theatre and continued to refer to it as Grauman's, so in 2001, they officially reinstated the name Grauman's, which once again adorns the historic landmark. However, in January 2013, TCL, an electronics company in China, bought the naming rights to change it to TCL Chinese Theatre, including for the cinema operations. So on the website, it's now TCL. 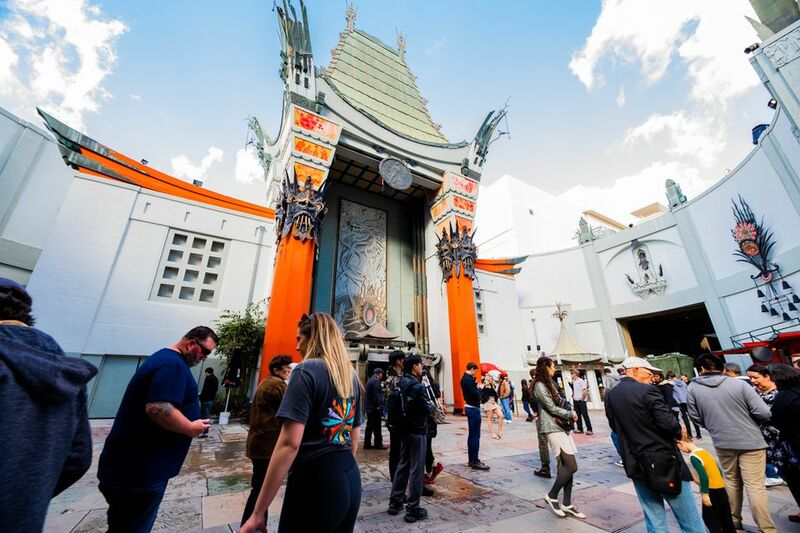 Locals, including some people in the media, are once again resisting the change, still calling it Grauman's or referring to it simply as The Chinese Theatre or the Hollywood Chinese Theatre. The Chinese Theatre is a popular location for Hollywood Movie Premieres. You can check the Premiere Schedule on their website. You can't buy tickets to premieres, but you can line up with other fans to get a glimpse of the stars on the red carpet or you can watch from the comfort of your home via the Forecourt webcam. Movies run all day in the upstairs TCL Theatres, including an IMAX screen, accessible from inside Hollywood & Highland Centers, but the opulent main theatre that opens onto Hollywood Blvd is generally used only for premieres and special events. Tours are available all day, every half hour as long as no other events are scheduled. Call the number below to confirm tour availability. Parking: at Hollywood and Highland shopping and entertainment complex, $2 for 4 hours with validation or metered street parking on side streets. Beware of designated tour bus parking. Tours: VIP Tours are offered daily. Call 323-463-9576 for prices and tour times, or email tours@chinesetheatres.com. Whether you know it as TCL, Grauman's or Mann's, no trip to Hollywood is complete without a visit to the Chinese Theatre to step into the footprints of the stars. It's one of the Top Free Things to Do in LA and Most Photographed LA Landmarks, along with the Hollywood Walk of Fame that runs in front of the theatre. Right in front of the theatre is the Hollywood Walk of Fame. The Dolby Theatre is right next door to the east and in 2009, Madame Tussauds wax museum opened adjacent to the Chinese Theatre on the west side. El Capitan Theatre, Disney's Soda Fountain and Studio Store and the Disney Entertainment Center where Jimmy Kimmel is taped are across the street.